"[I am] five feet nine. Quite little, really. From a squat tribe, you see. My brothers (and sister) are all taller than me, as are most of the actresses I'm required to smooch. At such times they usually stand me on a box. Sort of keeps your feet on the ground, paradoxically." If an actor looks too short next to a costar, the easiest thing to do is to have them stand on something to make them taller. Named for a special box from the production of The X-Files. Standing at 5'2" (1.57 m), Gillian Anderson was much shorter than David Duchovny, who was 6'0" (1.83 m). Consequently, to keep Scully and Mulder on roughly the same plane while shooting them together, they developed a special box for her to stand on (also referred on set as "Gilly-Board" after the actress). Unlike the traditional movie apple box or trench, a Scully Box can be stacked up, or laid out in a runway. It's very versatile and used to accommodate large height differences between cast members. The term "apple box" is prevalent in the industry for an actor-heightening wooden box of a given dimension, typically: 12" × 8" × 20" or 30 × 20 × 50cm. A Scully Box is an 'apple' and a half and is constructed of aluminum covered with outdoor carpeting for sound-deadening and traction. If the camera is lowered and angled upward to create the illusion of height, it's a Hitler Cam shot. In Lucky Star's opening, Konata's skirt is shown on the same level as the other girls, but she is significantly shorter than them, which leads to the obvious conclusion. Invoked in Episode 15 of the Ace Attorney anime; Pearl has to jump onto a box in order to see over the Defense Stand. Played for Laughs in Chapter 36/Episode 8 of Monthly Girls' Nozaki-kun. Nozaki is so bad at perspective that, when forced to draw his own backgrounds, every scene has at least one character who seems to be hovering in mid-air. He solves this by drawing a box under their feet — every single time. When Hori (the assistant who normally draws the backgrounds) complains, Nozaki tries to justify it In-Universe with a panel where the manga's female lead declares that carrying boxes everywhere is the current fad, prompting Hori to shout "That's not the issue here!" Rorschach invokes this in Watchmen. When the police arrest him, they find he wears platform shoes to make himself taller. On the cover of the The Lone Gunmen comic book a publicity shot of the cast is used which due to lack of cropping, the Scully Box used to make Byers and Frohike the same height as the rest is very obvious. In Toy Story, since Woody is actually much taller than Buzz, in scenes when they had to talk with each other but their feet wouldn't be in the frame, the animators would actually have Woody's legs clipping into the ground. They called it "Ditching". In Brave, when Bear Elinor is standing, she is more than twice Merida's height. To fit both characters into the same shot, the animators sometimes sunk Bear Elinor into the floor a bit. In one scene in ParaNorman, Norman's father is made taller than his son in this way in order to emphasize the disconnect between the two. The box is steadily replaced with smaller and smaller boxes as Norman walks away. Some movies used this to make the already 6'5" Michael Clarke Duncan look superhumanly tall. The Green Mile made his character look much taller, which especially came in handy next to the similarly tall David Morse. Daredevil used this in conjunction with Hitler Cam. Inverted in the Scary Movie series when actor Kevin Hart had to stand in a trench in order to be noticeably shorter than the other actors. Since Kevin Hart stands 5 feet 4 1/2 inches tall, it seems that he frequently employs this device, rather than subverting it as he did in this movie. Invoked in Godzilla (1998). Charles Caiman (played by 5'6" Harry Shearer) meets his new co-anchor for the first time while she's sitting in her chair on-set. He sits next to her and the top of his head barely meets her chin. With the news starting in a few seconds, he desperately asks the producer for a pillow or phone book, then resorts to holding himself up by the arms on his chair. In Casablanca, Humphrey Bogart (5'8") had to stand on a box to kiss Bergman (5'9"). But it was worth it. Similarly, in Gaslight Charles Boyer — despite being the same height as his leading lady — stood on a box for head and shoulders two-shots with Bergman. Used in Notorious for the diminutive Claude Rains (5'6 1/2") in some of his shots with Bergman, including one scene where he enters a room and ascends a ramp ◊ as he approaches the camera (and Bergman). The UK bus-side poster for Four Christmases has Reese Witherspoon visibly standing on a stack of boxed presents, as she's a foot shorter than her co-star Vince Vaughn, who is... really damn tall. In X-Men, James Marsden had to use these when filming around Hugh Jackman and Famke Janssen. At 5'10", Marsden is not short, but Janssen is 6'0" (not counting heels) and Jackman 6'2". This is especially ironic since Cyclops (Marsden) is canonically about a foot taller than Wolverine (Jackman), whose shortness is one of his most iconic traits.note For the record, in the comics Cyclops is 6'3", Jean Grey is 5'6" and Wolverine is 5'3". The DVD extras reveal Marsden playfully griping about this fact, and when the team arrives at the Statue of Liberty you can see in a wide shot just how big his boots were. In the second and third movies, scenes with Jean and Scott together were carefully framed so that their legs and feet were not visible, because he was standing on boxes and she wasn't wearing shoes. While Apocalypse does wear combat boots in the comics, in the case of X-Men: Apocalypse they were used as an aid to make the average-sized Oscar Isaac (5' 8½"\1,74 m) more imposing even if not massive (he looks eye-to-eye with Michael Fassbender, who's one and a half inches taller). In I Love Your Work, Giovanni Ribisi's character kisses a woman while filming a scene in an elevator, then promptly hops off the Scully Box at the end of the take, revealing that the woman is about six inches taller than him. The Disney Channel movie Double Teamed, which portrayed WNBA twin sisters Heather and Heidi Burge (both 6'5"), had the actresses portraying them (who weren't twins, and in fact weren't even related) using several methods to tower over their teammates, from Scully Boxes to specialized sneakers. This has been done digitally and with camera angles as of recently, most notably with Robbie "Hagrid" Coltrane (who at 6'1" is pretty big, but no giant) in the Harry Potter film series to make him seem like a half-giant. Pretty much everyone of average height who shared a scene with Elijah Wood, Sean Astin or any other hobbits in the trilogy, in order to make the hobbits seem shorter, in conjunction with forced perspective and body doubles. The sole exception was John Rhys Davies, who (by sheer coincidence) is as much taller than the hobbit actors as a dwarf is supposed to be, so shots involving only them could dispense with any height trickery. The same trick was used in The Hobbit movies, especially as the Dwarf actors (as well as Martin Freeman) interact with taller characters like Gandalf and Thranduil. Speaking of Thranduil, this happened to practically anybody who shared close-ups with the 6'5" Lee Pace. In long shots, he towers over pretty much everyone but in closer shots, most of the other actors had to stand on something. In Julie & Julia in order to have Meryl Streep (5'6") reflect the height of Julia Child (6'2"). They also used smaller scale props and hired short actors to be extras in her scenes. In Back to the Future, because Christopher Lloyd (6'1") is much taller than Michael J. Fox (5'4"), director Robert Zemeckis used camera tricks to avoid using one. For example, the two are rarely in the same shot together and, when they are, one is usually sitting down or much closer to the camera than the other. When Doc Brown is talking, he's often moving around so much that the viewer can't really tell how tall he is. Lloyd also improvised a hunch in his posture that helped give the character more of a Mad Scientist look. Used in-story by Linda Hunt's character in Silverado. Kevin Kline first meets her while she's tending bar. When she comes around to the other side, she's suddenly a foot shorter. He leans over and looks behind the bar to see a ramp along the other side for her to stand on and comfortably reach the table. She has a very philosophical view of things, though. Stella: Life is what you make of it, my friend. If it doesn't fit, you make alterations. In Water for Elephants, Reese Witherspoon at roughly 5'2" shared the spotlight with Robert Pattinson, who is a foot taller. In an interview, she mentioned this was in liberal use for the kissing scenes. An amusing example: Brad Garrett (Robert from Everybody Loves Raymond) was cast as comedian Jackie Gleason in a biographical movie (titled "Gleason", naturally). Because Brad Garrett is known for being extremely tall (as in 6'8"! ), everybody else in the cast had to wear platform shoes in all their scenes with him. In In Time Amanda Seyfried (5'3") is paired up with Justin Timberlake (6'1"). Rather than use a box or use perspective shots to try and hide the height difference the filmakers decided to make it part of the character and Seyfried is never seen without a pair of very distinctive towering purple high heels. Marlon Brando (5'10") is always shown from the waist up in Apocalypse Now to seem like the 6'6" Kurtz described in Heart of Darkness. Miley Cyrus is about 5'6", but her love interest in The Last Song was played by (future husband) Liam Hemsworth, who is 6'3", so this technique had to be used on occasion and it can be clearly seen in outtakes from the movie's promoshoot like this one . Used in at least one of the Dirty Harry films, given Clint Eastwood is really tall. Inverted in Judge Dredd, where it's to make Sylvester Stallone tower over the young recruits. In The Dark Knight Rises, Tom Hardy (5'9") needed three-inch heels to be able to look Christian Bale (6') in the eye, since having Bane be shorter than Batman would severely undermine the dynamic of the characters. Any shot that does show both of their feet is instead using their stunt doubles. This is also why Bane spends the entirety of the notorious opening sequence kneeling, sitting, or getting jostled around by the plane; Tom Hardy is a bit shorter than Aiden Gillen (also 5'9"), which would make the CIA agent's comment about him being a big guy a bit weird. Also employed in the "Do you feel in charge?" scene with John Daggett; Bane towers over Daggett in the sequence, but at 5'11", Mendelsohn is actually a good two inches taller than Tom Hardy on level ground. Inverted in The Phantom Menace; the set designers had to spend an extra $150,000 adjusting some of the sets to accommodate Liam Neeson's 6'4" height without making the wise mentor figure look ridiculously oversized in some of the confined spaces. Hayden Christensen (6'1") had to wear lifts in his shoes while portraying the costumed Darth Vader at the end of Revenge of the Sith in order to be closer to the height of the original Vader David Prowse (6'6"). Robert Downey Jr. is 5'7" and had to wear some truly impressive ◊ high heels while filming Iron Man and The Avengers, since he spent most of the films sharing the screen with Chris Hemsworth and Chris Evans and Gwyneth Paltrow (his love interest in all three films) and all three tower over him - in Gwyneth's case, especially when she's in heels ◊ (which is also why she's visibly barefoot at the scene at the tower when they're together). The blooper reel of Iron Man 3 shows Downey in a Scully Box while talking with the 5' 10" Rebecca Hall (bonus: Tony's supposed to be in armor, and Hall is only in sneakers!). Scarlett Johansson is 5'3", and while the use of the box wasn't as obvious in The Avengers, it was made more apparent in Captain America: The Winter Soldier where most of her scenes were shared with Chris Evans, who is 6'0". 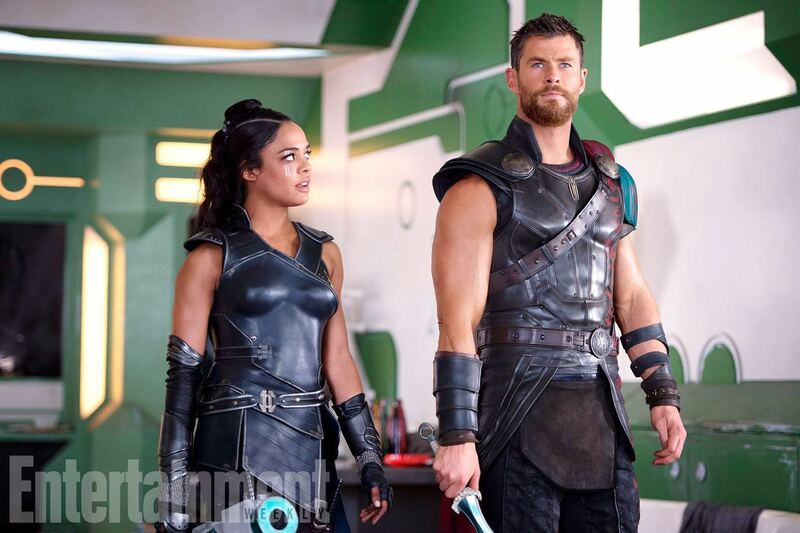 Thor: Ragnarok introduces Valkyrie, who while badass is played by the 5'4" (1.63 m) Tessa Thompson, much shorter than ◊ Chris Hemsworth's Thor and ◊ Tom Hiddleston's Loki. Aside from wide shots - most blatantly when Val and Thor board a ship simultaneously and end up staring at each other - the camera tries to downplay the difference. While Danny Trejo is extremely buff, he's only 5'6''. All his movies use tricks to make him look taller. In every close-up shot that the 5'8" tall Mel Gibson shares with the 6' even Sigourney Weaver in the film The Year of Living Dangerously, he's on a box so that it looks like he's taller than she is. In Kindergarten Cop, Arnold Schwarzenegger (6'2") is often shown sitting in every scene he has with Linda Hunt (4'9"). In The Hunger Games films Jennifer Lawrence and Josh Hutcherson, who plays her main love interest, appear the same height when they are shown side by side. In reality, Lawrence is two inches taller. This is actually parodied in How It Should Have Ended's video of The Hunger Games, zooming out to show Peeta falling off the box after eating poisonous nightlock berries. In Vault of Horror, Tom Baker's character appears the second shortest out of the main cast in the framing story. Some elaborate scaffolding must have been used to achieve this, since he's the tallest out of the actors in reality, at 6'3". Terminator Genisys frequently disguises how Emilia Clarke is so much shorter than Jai Courtney and Arnold Schwarzenegger. Then averts it in a comedic way when all three take mugshots, and it's clear the men are One Head Taller. Played for Laughs in E.T. the Extra-Terrestrial. When Elliot gets intoxicated by E.T. 's Psychic Link, he kisses a female classmate. Since she's much taller than him, he stands on top of a tripped classmate to kiss her. As revealed in the Special Effects commentary tracks for Aliens vs. Predator: Requiem's special edition, this was used to make the 6'2" Tom Woodruff Jr.'s Predalien tower over the 7'1" Ian Whyte's Predator. In Scream 4, Emma Roberts, who at 5'2" was easily one of the smallest members of the cast (only Hayden Panettiere was shorter), had to wear seven-inch-high boots to avoid being towered over by her co-stars. Since she played the killer, it was extra important that she look like she wouldn't get knocked over by a strong wind. Sofia Boutella requested the costume designer of Star Trek Beyond to put heels on the combat boots she wore as Jaylah. 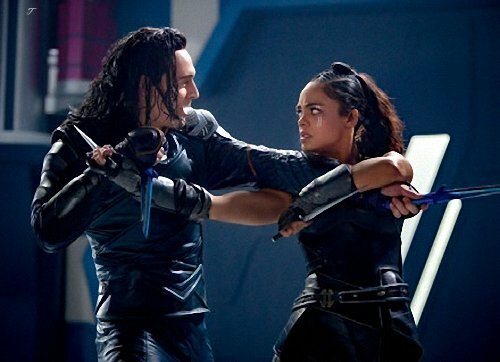 After all, she's 5'5" (1.65 m), and while most of Jaylah's scenes are with the average-sized Simon Pegg, the height difference would be worse when the other men appear. Simon Pegg himself wore lifts in his shoes in The World's End because the actor playing his character's younger self was about 2 inches taller than him. Sophia Lillis had to stand on an apple box when she was filming scenes with Stephen Bogaert in IT 2017, because she is only 5'0", and he is around 6'0". Invoked in Ball of Fire when Sugarpuss (5'5" Barbara Stanwyck) stacks and stands on two books to demonstrate "yum-yum" with Bertram (6'3" Gary Cooper). 8 Out of 10 Cats host Jimmy Carr has to have a cushion placed on his seat so he can see over his desk. This led to a fairly hilarious scene when guest David Walliams "outed" him by insisting that he stand up, and then removing the cushion, leaving Jimmy about four inches shorter all of a sudden. Also subverted since Jimmy Carr is a good 6 feet tall, so it's more of an issue with the set (or for entirely comedic purposes). On All in the Family, Sally Struthers regularly wore platform shoes, as she was 5'1" while her TV husband, Rob Reiner, was 6'2". The height difference is played for laughs in a flashback to when their characters, Gloria and Mike, first met. On Arrow, the 5'5" Emily Bett Rickards (Felicity Smoak) spends most of her scenes with the 6'1" Stephen Amell (Oliver) and the 6'3" David Ramsey (Diggle). You can see where this is going. In fact, her Twitter bio used to say "I stand on apple boxes for a living." Bernadette is played by the under 5' Melissa Rauch, but Howard, her boyfriend (later husband), isn't that much taller and thus it isn't that big of an issue. In one episode at her apartment, she got a ring at the doorbell and in order to look through the peephole she had to use a step stool. Rauch mentioned that most of her family is pretty short and her husband is around 6', so whenever they get together it feels like he is visiting the Shire. Both Leonard and Howard are fairly short, which is commented upon frequently in the show. Leonard and Penny are generally the same height but if Penny wears high heels she towers over him. In one episode the group was having a formal cocktail party and Bernadette was complaining about climbing the stairs in high heels and Howard revealed he was wearing heels as well. 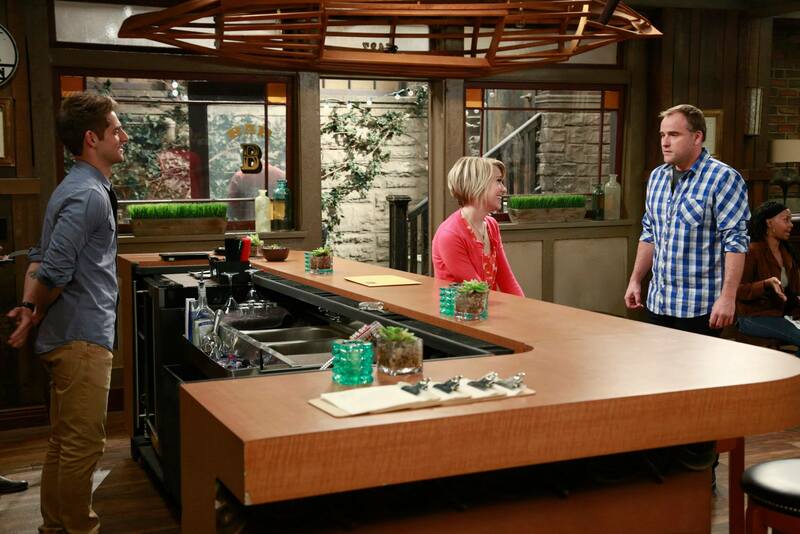 After a confrontation, Sheldon comments that Howard seemed taller than normal. On the 9th season of Australian reality show/renovation show/competition The Block, contestant Deanne, married to the much taller, retired pro-sports star Darren (a solid 2 m tall — roughly 6'8"), stands on a Scully Box during the weekly judging. The box can often be seen in the shots showing all contestants. While Angel was in the series, Sarah Michelle Gellar had to stand on a box just so she could be seen in the same frame as the much taller David Boreanaz. The later seasons had her wear high heels to have Buffy appear taller than Dawn. James Marsters, who plays Spike, has admitted that he would wear lifts in his shoes so that he would look about equal height to David Boreanaz. Though it was bizarrely not used during Buffy's romance with Riley, with the 6'2" Marc Blucas (who'd even hoped to become a pro basketball player before getting into acting) having to practically bend himself in half to kiss Gellar. In "Once More, With Feeling", for a scene where Willow and Tara walk through the park, Alyson Hannigan can be seen wearing high heels in order to minimize the three-inch height difference between herself and Amber Benson. Castle: Stana Katic is tall at 5'9" but Nathan Fillion is 6'2". Even though the show is called Castle, the two actors' roles are basically equal in importance. So Katic almost always wears 3- to 4-inch heels, which are her version of the box. This is Lampshaded quite often on the show as asides from other characters and it is very obvious when she is not wearing heels. This example is also unusual because height differences of only a few inches such as this usually don't cause an issue. The raised platform holding the desk serves a similar purpose: observant viewers will note that Jon Stewart, who is 5'6", always shakes the guest's hand before they step up onto the platform. Despite this fact, Stewart constantly jokes about his height. He used the raised platform on The Colbert Report to briefly make himself look taller than 6'4" Conan O'Brien during the Mêlée à Trois crossover between the three shows. Stephen Colbert: That's the magic of television, Jon. Jon Stewart: Can I have a screengrab of that? In his debate with (6'4") Bill O'Reilly in 2012, Stewart went a step further, using a lifting platform that would allow him to tower over O'Reilly (and every inch in between) — used primarily to defuse tension and get some laughs. As shown by the many Real Life examples below, it's actually fairly common in debates between people of significantly different height to use boxes or platforms to equalize them (which is why Stewart had one). Appearances influence opinions, after all, and to prevent height, a factor beyond anyone's control, from influencing the result, it's important that the participants stand at a more-or-less equal height. 5'6" Louise Jameson wore knee-high moccasins with a wedge heel as Leela because she was co-starring with 6'3" Tom Baker. Used in the promotional pictures for the TV-Movie to make Paul McGann appear to be taller than Sylvester McCoy. In reality McGann, with his height of 5'8.5" (1.74 meters), is pretty close to McCoy's 5'6" (1.68 meters). During John Barrowman's first five episodes, Billie Piper had to stand on a box whenever she was in a scene with him since he is seven inches taller than her. This is an unusual example given that John Barrowman and Christopher Eccleston are the exact same height (6'), and she never did so with the latter. It probably has to do with the mystique of the Doctor. Freema Agyeman is below-average height, so Martha Jones is almost constantly wearing heels. Used In-Universe in the Christmas special "Voyage of the Damned", where Kylie Minogue's character stands on a box to kiss David Tennant. It's Played for Laughs. This was needed, but the actual box technique itself was averted, come time for Matt Smith to step into the shoes of the Doctor. For his most iconic enemy, the Daleks, those that remained were tailored for Billie Piper's height previously, but instead of employing any camera trickery or boxes, they simply redesigned a new set of Daleks to match Smith's considerably taller frame. Unfortunately, they weren't very popular with the fans and have since been benched. Jenna Coleman, measuring all of 5'2", has stated that an apple box is required for some shots with 6-foot-tall Peter Capaldi. Her character Clara Oswald's penchant for wearing heels is clearly due to this trope as well. Elementary has the 5'2" Lucy Liu with 5'10" Jonny Lee Miller. This results in Joan Watson wearing quite a lot of heels. In Get Smart, Barbara Feldon was slightly taller than male lead Don Adams. This led to Don Adams standing on an apple crate or Barbara Feldon bending her knees and/or not wearing shoes so he would appear taller than her in close-ups. Staging scenes is often difficult because of this, especially when Cory Monteith was involved. Monteith was much taller than anyone else in the cast (even the cast members playing teachers), thus he spent a lot of time not only sitting but also leaning forward with his forearms resting on his thighs (otherwise seated cast members behind him still wouldn't be visible). Other times they actually used his height to their advantage, for example: When sharing a scene with Rachel the camera sometimes switched to a shot closer to her perspective which only served to make him look even taller. Chris Colfer is slightly taller than his on-screen love interest, Darren Criss, but, because Criss' character was meant to serve as a mentor type figure, efforts were made to make him appear taller than Colfer, even in photo shoots promoting the show. Grey's Anatomy, in-universe: Miranda Bailey is very short and can clearly be seen using a variant in the OR to ensure she is at the proper height when operating. Required quite often on Heroes whenever Hayden Panettiere and Kristen Bell, who are both 5'1", share scenes with Zachary Quinto, who is 6'3". How I Met Your Mother has 6'4 Marshall paired with 5'4 Lily, which is sometimes commented on. But the rest of the male cast is still above 6' and the other female cast member Robin is a fairly tall 5'9, which leaves Lily as often wearing high heels even when lounging around at home. Nathan Kress was very short in the first season, compared to the two girls in their power trio. So he had to wear a very visible pair of giant platform boots. By the time season 2 started, he'd hit puberty with a deeper voice (mentioned on the show), and he was as tall as Carly. In the current episodes, he's starting to tower over Carly as well. In Season 4, Miranda Cosgrove has continued to get taller, while Jennette McCurdy has not, so in episodes from Season 4 onward she starts wearing platform shoes. Jeopardy! does likewise for shorter contestants so that they can see over the podiums. This was humorously referenced on the celebrity episode of February 9, 2001, on which Seth Green was a contestant. Alex Trebek: We started off the week, ladies and gentlemen, here in Las Vegas with me feeling vertically challenged because one of our contestants was [6'6"/198 cm] Charles Barkley and I felt very short next to him. Seth [who is 5'4"/163 cm] took pity on me. Alex Trebek: He wants to make me feel a lot better. The 1993 College Tournament winner Phoebe Juel recounted that the coordinators had to search the studio for more boxes because the ones which were on hand were still too small for her. Inversion. In the later seasons of M*A*S*H with Major Burns, Burns seems to get shorter, despite Larry Linville being 6'1" to Alan Alda's 6'2", and Mike Farrell's 6'3" (BJ, in particular, seems to be noticeably taller than Burns, while Trapper, played by Wayne Rogers who is also 6'3", did not). It may have been a nod to the movie, where Burns was played by Robert Duvall (5'8"), Hawkeye by Donald Sutherland (6'4"), and Trapper by Elliot Gould (6'3"). In "Scott of the Sahara," an actress is standing in a trench on her own feet, while the actor with her is on a box. The result is ridiculous height disparity. And then, when the actor suggests that he get off the box and she gets out of the trench in order to bring them more-or-less on the same level, she flounces off in a huff because she never works outside of a trench. In a skit about horse jockeys, several jockeys are so short that only their hats are visible in frame. Another jockey is so short that he has to stand on a box just to make his hat visible. In The Orville, Seth MacFarlane's boots help make him look taller than Adrianne Palicki, even though he's only an inch shorter than her. Both of them typically tower over the rest of the cast. Inverted on Password Plus, where host Allen Ludden was placed in a depression on the set so as not to appear as tall in comparison to the contestants. One contestant fell in Allen's "pit" upon walking back from the Bonus Round to the tables for the main game. Jeremy Brett: So he watched the previous thirteen films (and) decided to try and look a little like David Burke, as much as he could, bless him. So he put on a rug, I mean a toupee, and put lifts in his heels. And the first film we shot together was "The Abbey Grange". And we were running across a field, and these heels were too high so he was slipping and sliding. And I said, "Oh, Edward, take them out! I'll bend my knees for the rest of the film!" Allison Mack (5'5") admits to using either a crate, or a lifted "alley board" so she doesn't look short against "ostentatiously tall" Tom Welling (6'3"). It is the only way they could hug naturally with the 10 inches difference ◊. Cassidy Freeman uses it a bit as well, despite being 5'9". Parodied in one scene in which Erica Durance kicks a stack of paper next to Tom Welling's feet (on screen) before running to him. One of the more visible examples, as the moment in question eventually made it into the opening credits. Oddly, in "Upgrade", Callum Blue (6') is somehow shown to be several inches taller than Tom probably due to misuse of boxes. Referenced in the behind-the-scenes scenes of the Stargate SG-1 self-parody Show Within a Show Wormhole Xtreme. The male lead requests a "half apple" for the kiss scene with a noticeably taller woman. Inverted in Star Trek: The Next Generation, where due to Jonathan Frakes being significantly taller than most of the cast, Riker was often shown learning forward in a Captain Morgan Pose, simply because it was the only way they could manage to fit him into frame. Heck, an old back injury and the fact that he was even too tall for many of the sets and props led to the so-called "Riker Maneuver" where Frakes would swing his leg over a chair before sitting down, sometimes all the way over the back! Similarly, spin-off Star Trek: Deep Space Nine rarely made any effort to conceal height differences between actors, averting Teens Are Short by allowing the 6'3" Cirroc Lofton to tower over virtually everyone else and the 5'7" Jeffrey Combs to appear much shorter than most of his costars. Most noticeable when the two share a scene. Both Katie Cassidy (5'7") and Genevieve Cortese (5'4") played the demon Ruby. Since almost all of their screen time was spent in the company of the 6'4" Jared Padalecki and 6'1" Jensen Ackles, tall, spiky heels became a standard of Ruby's wardrobe from the get-go. Katie Cassidy has stated these caused her to lose her balance on more than one occasion. According to Richard Speight (Gabriel), he had to use four of these while sharing a scene with Jared and Jensen. Without them, he wasn't even in the frame. In earliest seasons of That '70s Show, the scenes where the 15-year old Mila Kunis (Jackie) and Laura Prepon (Donna) talked alone had either to portray them sitting, or to have Mila wearing platform heels. Not quite a box, but very close. Top Gear: The Hamster was once seen to be standing on a box so he could see over the bonnet of a Cadillac Escalade. Melissa Rauch also had this taken to new levels when she was on True Blood as she spends most of her screentime with 6'4" Jim Parrack. Used in-universe in Veep, where the Vice President's assistant has a folding stepping stool in his bag for her to use during speeches when the lectern is too tall. This is understandable, given that the actress, Julia Louis-Dreyfus, is 5'3". This causes Vice President Meyer some embarrassment in one episode when it's revealed that her box is made of a special metal alloy and costs $1200. Wheel of Fortune puts the contestants on risers that may be raised or lowered to fit their height and make spinning the Wheel easier. However, this doesn't always work, particularly for little people or wheelchair-bound contestants, who are allowed to bring a friend or relative to spin the Wheel for them. When Christina Aguilera and Justin Timberlake embarked on a tour together, they did a photo shoot for Rolling Stone to promote the tour where they were eye level. However, because Justin is 6'2 and Christina is just barely over 5 feet tall, he had to bend down while she had to stand on a step ladder in order for them to be at eye level with the camera. During the 2005 Academy Awards, Prince gave Best Original song to Jorge Drexler for his contribution to The Motorcycle Diaries. Poor Drexler had to hunch so he could use the microphone set for the 5' 2" star. President George H.W. Bush made it a personal rule never to be photographed standing next to Ronald Reagan while he was Reagan's Vice President because the 6'2" Bush didn't want to overshadow his boss (Reagan was 6'0"). Michael Dukakis, Bush's challenger in 1988, wasn't abnormally short (5'8") but the height difference with Bush, combined with a broader physique compared to Bush's, made him seem short, and Dukakis's sensitivity on the subject came to light when a Boston Herald photographer sneaked behind the podium and took a picture of the governor standing on a box inside the lectern during a campaign speech. Parodied in the SNL debate in which Dukakis, played by Jon Lovitz, adjusted his position behind the lectern using a noisy motorized lift. During a debate when Robert Reich was running for governor of Massachusetts in 2002 (against the 6'2" Mitt Romney), a camera pan showed he was standing on one of these behind the podium. Understandable, since Reich is 4'10" due to a bone condition. He's made fun of this in interviews, notably during one with the famously tall Conan O'Brien. John Kerry, former longtime Massachusetts senator and former Secretary of State, frequently has this device used by people he's posing with, since at 6'4" he towers over practically everyone. This is especially notable whenever he has to stand next to Massachusetts Governor Deval Patrick ◊ and is a good head and then some taller. It's also thought that this is one reason former President George W. Bush was frequently drawn as a midget in political cartoons, since while the real Bush is actually 5'11" — not small by any means — he wound up looking short next to the outrageously tall Kerry (same with Al Gore, who's 6'2"). There was apparently some behind-the-scenes handwringing by the Bush staff about this (previously, though likely coincidentally given the fairly small sample size, the taller major-party candidate had always been the winner of the presidential election) that resulted in negotiations with his competitor's counterparts about the best way to film them to prevent this, not that it worked. 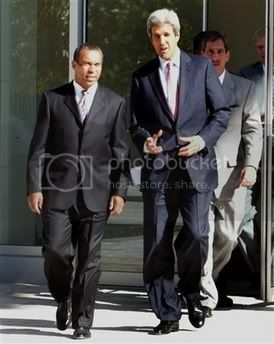 Former French president Nicolas Sarkozy used lifts in his shoes to appear taller. During an event where speeches were given by Barack Obama and Nicolas Sarkozy, several pictures were taken from the side, revealing the... vertically challenged French president had stood on a box, presumably because he wouldn't have reached the microphone — set up for the 6'1" Obama — otherwise. Sarkozy, who is 5'5"note That's an inch shorter than the actual historical Napoleon, folks!, even needs one of these when pictured with his own wife, an ex-supermodel. In a Swedish election debate in 2014, the state TV channel had Social Democratic leader Stefan Löfven stand on a box when debating incumbent (and taller) Prime Minister Fredrik Reinfeldt. The box drew attention among the viewers. In the election, Löfven defeated Reinfeldt. The WWF's André the Giant frequently employed a crate during backstage interviews; he was already incredibly tall and large, but this served to make him truly tower over the interviewer. Sadly, the condition that caused his large size ultimately led to his early death. When he came into the WWF in the 1990s, Jorge "Giant" Gonzales was 7'7" tall. Despite this, he wore lifts in his boots so the WWF could bill him as being "nearly 8 feet tall". Kane stands at about an impressive 6'6, but because he was supposed to be bigger than his kayfabe brother The Undertaker, who is about 6'8 (billed at 6'10), he wore lifts in his boots to be closer to his billed height of 7 feet. Sometimes used in-universe in Ace Attorney when somebody is too short for the witness stand, such as Cody Hackins from the first game, who is a young boy. Apollo lampshades this in the fifth game when a witness makes fun of him for being short, while the witness himself needs a box to testify. In Dark Souls I, Solaire of Astora's model is blatantly floating in the air to give the impression he's about half a head taller than the player character. Also true of the Crestfallen Merchant in Sen's Fortress, but the layout of the room he's in (including a floor texture that plays with visual perception) make it harder to notice except when close up. By the time of the sequel the developers overcame the issue, as demonstrated with Vengarl, who's really that tall. In Dragon Age: Inquisition, romantic scenes between a Dwarven Inquisitor and Iron Bull are identical to when you pursue him as any other race, despite Dwarves being half the size of Qunari. But a scene in the game's ending shows the Inquisitor standing on a stool so that Bull won't have to stoop down as much, with the humorous implication that your character is always standing on something when they make out. This was added to solve one of the animation issues that nearly made Bull's Romance Sidequest race-exclusive. Ryoma Hoshi from New Danganronpa V3 is the shortest character in the series at a mere 3'5", and because of this, he has to stand on a stool during class trials. This also happens when the robotic teddy bear Monokuma joins the students in the final class trials of both the first and second games, in which he stands on a vaulting horse to be the same height as the students. Yennefer in The Witcher 3: Wild Hunt is actually very small compared to most other characters. Her height compared to others can seem inconsistent in cutscenes where her feet aren't visible because she is often levitating off the ground to get the proper angle. Charlotta of Granblue Fantasy is a Harvin who is very sensitive about her height and as such is prone to standing on large wooden boxes to look more dramatic. Her Light variation has her Victory pose as her standing on a stack of boxes that will alternate between putting her at even height with others to having her tower over them. When Drowtales released its 14th chapter the cover showed Ariel and Chirinide standing back to back and at even heights, even though other pages show that Ariel is about a head shorter. The joke naturally became that she's standing on a stump, or in one piece of fanart, Rikshakar. Ironically after a 15 year timeskip Ariel is now so tall that she has a full head of height on everyone in her squad . Elliot Morgan and, during the early days, Philip DeFranco, are both significantly taller than the other members of SourceFed, so everyone else has to stand on an apple box in order to look similar heights. The Cinema Snob and Diamanda Hagan's crossover review of Myra Breckinridge starts by showing their height difference as they are standing in a corridor. But later as they're sitting in bed they are leveled, with Brad even bigger... due to him sitting on a pile of pillows (easier to see in the blooper reel ). Earlier, while he confronts Kyle Kallgren in a corridor, the scenes of him berating Kyle are shown only up close. Once it gets to wider shot it's blatant why, as Kyle is taller. The Half in the Bag episode covering X-Men: Days of Future Past and A Million Ways to Die in the West has Mike mention (in his typical style) that Jay had to stand on a box to be "almost as tall as me". The Best of the Worst episode covering Bigfoot vs D.B. Cooper, Black Cougar, and Raw Force has Len Kabasinski suspiciously eyeing the wooden crate Jay is standing on, with Jay reacting with feigned ignorance. The scenario is then repeated with Mike, who is already tall enough, and subverted with Josh, much to Len's surprise. The "Artists vs TMNT" Epic Rap Battles of History behind the scenes shows that 3 sets of boxes were required for Link, Ian and Anthony so that their heights could align with the exceedingly tall Rhett. This twitter video , featuring the stars of The Most Popular Girls in School and Dr. Havoc's Diary, has Lee Newton standing on one of these. The short film Applebox parodies this - revolving around a big movie star who's actually The Napoleon and someone steals his apple box to Break the Haughty. The actor is played by James Madio, who is 5'3" and has said he's made use of this a lot. Jeremy Hawke in The Critic is apparently very, very short (18" shorter than he appears), and disguises it with heels. When one heel breaks, he starts running very askew. An in-universe example in the 1987 Teenage Mutant Ninja Turtles episode "Rondo in New York" when action Hollywood star tours the theater to promote his latest film. The actor is really short and has a crew placing apple boxes as he walks by the crowd looking down on them, much to Michelangelo's disappointment. A similar trick was done in Total Drama. Since Sierra is just shy of One Head Taller than her crush Cody, the animators had to cheat whenever she employed a Marshmallow Hell and kept Cody's feet a few inches above the ground. Tom Cruise is well known for manipulating his appearance to appear taller. Scully Boxes, and in just about every photo where you can see his feet, Cruise wears shoes with lifts to give him those much needed extra inches. Interestingly, Cruise is 5'7", only slightly below average, but he's so well known for this (and so frequently around other actors, who tend to be tall) that many people assume he's even shorter. In his wedding photos, where Scully Boxes couldn't be used, he had Katie Holmes squat down a bit so that she wouldn't be taller than him. After divorcing him, Nicole Kidman (who is 6'0") commented "Well, I can wear heels now." on Letterman. A bit of aside trivia, Cruise was the only actor in Top Gun that met the height requirements for a Navy fighter pilot. For comparison, Anthony "Goose" Edwards is 6'2", and was barely able to fit in the backseat of an F-14. This became a source of controversy when 5'11 baseball player Enrique Hernandez stood on a bucket when being interviewed by 6'1 Kelli Tennant, with many claiming it as an example of toxic masculinity in sports. David Miscavige uses a box for nearly every speech he makes. He also surrounds himself with short people and has regular-sized and tall people stand in the back for group pictures. 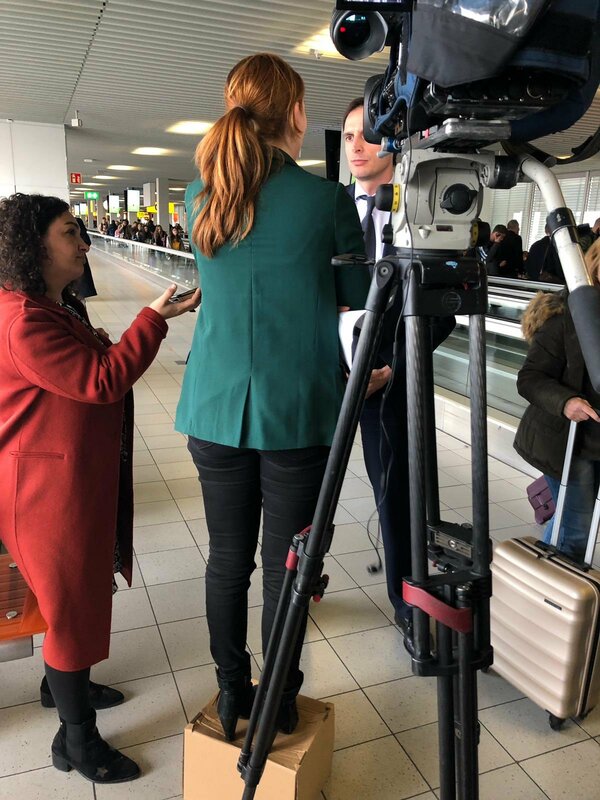 CNN reporter Frederik Pleitgen typically ends up with a cameraman on a box. Fred is very tall, and when doing interviews stands with his legs apart to bring himself down to the level of most of his interviewees. This way, they aren't looking up and we don't get a lovely shot of the subject's nostrils. However, to avoid the opposite effect of Fred looking down, the cameraman needs a boost to operate the camera at a suitable height. Famed architect Frank Lloyd Wright accomplished the same effect by designing many buildings around his own height of 5'8". Tall people find them notoriously cramped. Many photographers have boxes in their studios for just this purpose. It really comes in handy for couples with large height differences. Some studios also employ phone books (and other thick literary titles). In the BBC's flat racing coverage, Willie Carson, a five-foot-tall ex-champion jockey, employs one of these to be seen in shot with his much taller co-host Clare Balding. "Five feet nine. Quite little, really. From a squat tribe, you see. My brothers (and sister) are all taller than me, as are most of the actresses I'm required to smooch. At such times they usually stand me on a box. Sort of keeps your feet on the ground, paradoxically." In certain videos and photos, voice over Creator Couple Laura Bailey (5'2) is shown standing on a chair to reach her husband Travis Willingham (6'4). In some photos, she's sitting on his knee/lap like she's a child. Another with voice actor Troy Baker (6'3) and his second wife Pamela. There are a lot of photos showing her wearing heels, but it makes little difference to reach her husband's lips. In one of their wedding photos, he had to bend over in order to kiss her on the lips. Much snickering was heard 'round the interwebs when a side photo of Mark Zuckerberg's April 2018 testimony before a Congressional committee revealed he was seated on a booster cushion .